Three city centre shops in Southampton could be the subject of a Compulsory Purchase Order (CPO) in a bid to redevelop the area. 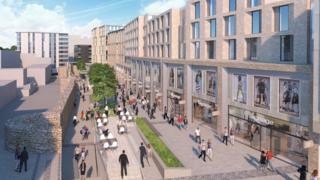 Homes and shops are set to be built alongside the medieval town walls in Queensway and East Street. City council leader Simon Letts said the authority had agreed to authorise CPOs if agreements could not be reached with traders. Businesses have already criticised the revamp which was approved in January. A British Heart Foundation shop, Casanova Italian restaurant and Pack and Send packing shop could be the subject of CPOs. Casanova and British Heart Foundation have declined to comment and the firm has not yet responded to a BBC request for comment. Other traders in the area, including Tiffany's clothes shop, have already reached agreements with developer Tellon Capital. Mr Letts said he hoped the remaining traders would settle, describing CPOs as a "last resort". The plans involve an open boulevard, making a feature of the medieval walls which are currently "hidden" among the side of buildings, he added. The Bargate was the first part of the town walls to be built, dating to about 1180, with alterations in about 1290. Southampton did not become a city until 1964. The existing 1980s Bargate shopping centre and multi-storey car park are among the buildings earmarked for demolition to make way for 152 flats, 185 student residential units, shops and restaurants.